The Glenn and Susan Brace / Center for Global Health Scholar Award | Center for Global Health, U.Va. The repercussive effect of one act, one person, one gift is indeed powerful. The Glenn and Susan Brace Center for Global Health Scholar Award is predicated on the exponential impact of one person. The Glenn and Susan Brace Center for Global Health Scholarship in 2018 supports three research projects which reflect the guiding principles of the award. Carolina Gomez Grimaldi (College of Arts & Sciences) working with student partner Caroline Shermoen (School of Engineering and Applied Science) and with faculty mentor, Professor of Sociology, Rae Blumberg, to collaborate on a study to assess breast and cervical cancer control strategies in Peru. The World Health Organization (WHO) reports that breast and cervical cancers are among the most common causes of death among women in Peru where late stage diagnosis due to structural and financial constraints are common. As noted by the scholars, “Often, women are deterred from getting screened for breast and cervical cancers due to beliefs that effective interventions are not available nor affordable.” Where many financial, cultural and geographic disparities exist, effective screening and treatment of precancerous lesions can largely prevent cervical cancer and increase cancer survival. Carolina and Caroline worked with local NGO, Liga Contra el Cancer, to catalogue existing control interventions, measure client knowledge, attitudes and practices (KAP) to map how the KAP of clients intersect with Liga’s prevention programs in the hope that this knowledge will lead to insight and improved practices for all concerned. Piper Emily Shifflett (College of Arts & Sciences) and Sara Grace Krivacsy (College of Arts & Sciences) contributed to a study of the Burden of Infection and Genetic Characterization of Malaria in Northern South Africa led by research fellow, Mukhethwa Munzhedzi, a Microbiology doctoral student at the University of Venda, currently training at the University of Virginia. Mentored by UVA Professor of Public Health Sciences, Liz McQuade, they worked to establish community contacts, pilot laboratory protocols, and analyze blood samples via malarial TAC PCR, rapid diagnostic tests and microscopy. Malaria which is a global health burden resulting in over 300 million clinical cases annually and ~425,000 million deaths worldwide. Outbursts have increasingly been found in even non-endemic malaria areas in South Africa, suggesting low-grade asymptomatic malaria in the region. This study focuses on the regional occurrence of asymptomatic malaria, the drug resistance profile, transmission patterns and risk factors associated with malaria as assessed by the knowledge and attitudes of study participants. Grace Alexandra Brown, worked with partner institution, University Teaching Hospital of Kigali (CHUK) in Kigali, Rwanda to conduct an inquiry on the impact of teaching cognitive aid use, over the presence of a cognitive aid alone, on performance and retention of advanced emergency airway management skills. Mentored by UVA Professor, Marcel Durieux, of the Department of Anesthesiology, Grace’s work focused on emergency situations in the perioperative setting, where health care professionals strive to manage the event according to best practices, with minimal morbidity and mortality. Guidelines outlining recommended actions can be difficult to implement in stressful, time-critical situations and long term retention of knowledge and skills has been shown to be particularly problematic in the context of resuscitation training. Decay of performance is attributed to the length of the retention interval, the duration between the acquisition of the skill and its eventual performance, for complicated but rarely employed skills; Cognitive aids have been suggested as a method to avoid dependence on memory in critical incidents.​ This study evaluated the impact of teaching cognitive aid use on performance and retention of advanced emergency airway management skills. The 2017 Glenn and Susan Brace Center for Global Health Award supported work conducted by Rawan Abdelrahman (CLAS) and Samantha Bergeron (CLAS) under the mentorship of Dr. Lalitha Swaminathan. Their work focused on youth health initiatives and education in multiple schools in the Gandigram region, India. 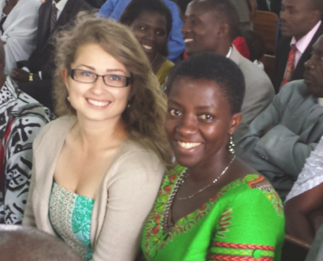 Multiple student researchers, pursuing diverse projects, were awarded Brace support in 2016: Eliza Campbell, Batten student, was mentored by the Honorable Minister of Health for Rwanda, Dr. Agnes Binagwaho, as she focused on direct implications of nation-wide implementation of health policy and programs. Porter Nenon, Adam Jones, (College of Arts and Sciences) and Kaija Flood, (Batten) conducted research on interventions for health and well-being in migrant communities in Rwanda, Sam Campbell, Mark Duda, Rosemary O'Hagan, and Charlotte Delaney, conducted a project with extensive antecedents in faculty, institutional and scholar effort and contributions. Their project, "Analysis of MadiDrop Distribution Channels and Health Effects of Local Water Sources in Dodoma Region, Tanzania" builds on the highly successful PureMadi research and interventions originated in South Africa. Research project, "Men, Masculinity and HIV in a Developing Community" located in South Africa and conducted by CLAS student, Sasheenie Moodley, was awarded Brace support in 2015. Sub-Saharan Africa carries 71% of the global HIV burden. Men in areas such as Gugulethu (Cape Town) under-demand and underutilize HIV prevention, testing, and treatment because of male gender norms that encourage strength, power, and independence. Moodley examined to what extent masculine gender norms limit men’s awareness of and the effectiveness of HIV interventions in the community. The research focused on men’s experiences in HIV support groups, issues of men’s use of and access to health (care) services, gender and the community organization of care, and the role of human rights discourses in HIV/AIDS treatment choices. The 2013 Glenn and Susan Brace Center for Global Health scholar awardees are Caitlin Eberhardt, from the Law School and Vivian Chan, from the College. Each scholars connects shared values for the Brace Award. Caitlin worked in the School of Law Human Rights Program and the Women’s Justice Initiative, founded and directed by former CGH Scholar, Kate Flatley. Vivian conducted a feasibility analysis of financing water programs in the UVa- Guatemala Initiative. Both share a passionate commitment to fostering significant global health research and service. Michelle Anderson, UVa School of Law, was the 2012 Susan and Glenn Brace Center for Global Health-University Scholar. Her project, "Botswana Intellectual Property and Access to Medicines in Botswana," was conducted as part of a collaboration piloted by UVa Faculty Mentor, Thomas A. Massaro, MD, PhD, School of Law. Also in 2012, Morgan Mullins, a Global Development Studies Major in the College of Arts and Sciences, worked in partnership with the Ram Family Awardee in Southern India. Her project, "A persistent correlation between Height for Age Z score and cognition in college aged women in South India," was mentored by Dr. Richard L. Guerrant, School of Medicine, University of Virginia. Melissa Rickman, CLAS, Foreign Affairs and the Frank Batten School of Leadership and Public Policy, and Claire Wyatt, CLAS, Global Development Studies were the 2011 Susan and Glenn Brace/Center for Global Health University Scholar Awardees. Their project, "Gross National Happiness in Bhutan: The Implications of the Introduction of Western Media on Perceived Happiness and Well-Being," was conducted in Thimphu, Bhutan, under the authority and guidance of the Gross National Happiness Commission (GNHC). Bhutan is a Himalayan kingdom of 700,000 people governed by the philosophy of Gross National Happiness, whose policies emphasize culture, the environment, good governance, and equitable economic development.